Government to import Doctors if KMPDU will fail to call off strike on Monday. - Bana Kenya News, Real African Network Tubanane. Home Nairobi Government to import Doctors if KMPDU will fail to call off strike on Monday. Government to import Doctors if KMPDU will fail to call off strike on Monday. The council of governor chairman Peter Munya has contradicted himself after the statement he read yesterday on the Doctors CBA withdrawal. The Meru governor said that the CBA will not be withdrawn if the doctors will go back to work. The Council of governor chairman also threatened the striking doctors today and said: "If the doctors will not report to work by Monday next week, then we will need to hire or import other doctors." The government has a plan of hiring doctors from Tanzania, Ethiopia, Cuba and South Africa in the next two weeks replacing the striking doctors. That will happen if the doctors will fail to report to work by Monday next week. 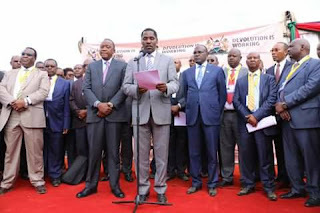 Speaking at the ongoing devolution conference at Naivasha, Munya directed the doctors who are now ready to sign the recognition agreement, to go to their respective counties for the county governments to sign the deal. On the other hand, the striking doctors, however, are insisting that the recognition agreement and the revised CBA be signed first before revising the return to work agreement and engage the respective county governments later.